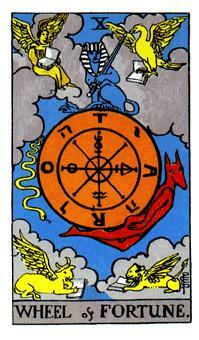 When The Wheel of Fortune Tarot Card appears it delivers a message of a new cycle in life. Good luck and fortune. For fate has brought this into your life rather than your own doing. This card bring a meaning to an end of current problems and rewards for past efforts that are long overdue. Negatively The Wheel of Fortune Tarot Card is obviously turning in the opposite direction and delivers a stark message of misfortune and unpleasant surprises. This, however, is only temporary. The wheel turns downwards but in good time it will turn up and your luck will change. This card is best discussed at more length with your reader who can can elaborate on the meaning of where it falls. The Wheel of Fortune Tarot Card speaks of a pivotal point in your life. The appearance of the Wheel of Fortune in your reading can show that a big change is not only certainly going to happen, but is certain to happen very soon in your life. Most often, the change shown in the Wheel of Fortune is a major change from the what you are used to.